A common way of initiating spiritual travel is waking up in a dream. 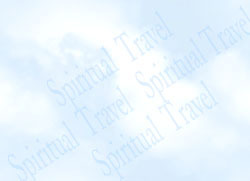 While this may be something that occasionally occurs to many people, it has a special value for the spiritual traveler. This is because the spiritual traveler has usually developed skill at directing inner experience through meditation or visualization exercises. He or she can therefore use the lucid dream (a dream where the dreamer wakes up and realizes he is dreaming) as point of departure for a journey into various realms of expanded freedom and awareness. In general, a spiritual travel experience which begins by waking up in a dream has an advantage over other methods of leaving the body because it is usually a gentle method of entering into the inner world. The powerful forces that one sometimes encounters in direct transitions out of the body from a waking state are avoided. It is also comfortable because the traveler avoids the formless side of spiritual travel which can be a shock to those not experienced in these areas. The traveler usually finds the dream environment familiar and non-threatening. However, there is also a disadvantage to this method. Dream environments are usually so much like physical environments that the traveler tends to assume he or she has the same limitations in the inner world that exist in the physical world. It takes discipline and effort to break out of the dream environment and find more interesting and rewarding places to explore. The Spiritual Navigation page gives some methods that can be used to break out of dream environments so that the lucid dreamer can begin spreading his or her wings and become a true spiritual traveler. In addition to techniques mentioned on the navigation page, a very simple method of changing consciousness is simply to fall backwards with the assumption that one will not hit the ground. This elementary exercise will usually result in the lucid dreamer floating or slowly drifting above the ground. This experience can have a profound effect on the lucid dreamer. This is because being in the physical world locks us into a set of gravitational assumptions that intuitively make us feel dense, weighted, compressed and limited. It is only when one experiences the joy of weightlessness of a nonmaterial body that these assumptions can be overcome and a different way of being can be experienced. To become light (or weightless) is to become like light (radiant physical or spiritual energy). It is this rudimentary experience of light (or lightness) that can be gradually amplified and expanded as a step towards spiritual realization. But even as a raw experience, it can provide the lucid dreamer with a special kind of spiritual knowledge by showing the dreamer something about the nature of the dream body and its potential. Understanding and experiencing the dream body as a type of supernatural body represents a kind of transformative knowledge that is difficult to obtain in ordinary life. Another simple activity is to search for and meditate on the sun or source of light in the lucid dream with the knowledge that the lucid dreamer is seeing spiritual light rather than physical light. This may involve finding a door to the outside or looking out a window but the result could be a spiritual or transformative experience when the dreamer is actively seeking such experience in the lucid dream. Another thing one can also do in lucid dreams is "reality testing". Here, the traveler tries to distinguish the experience in the lucid dream from normal sensory experience in the physical world. The difficulty of doing this presents a serious challenge to the common world-view of materialism which pervades our culture and assumes there is only one world of sensory experience (the material world) and one type of body (the physical body). In lucid dreams, there is an alternative world of complex sensory experience and a different kind of body with different abilities (i.e., a dream body). We explore this further on the page titled The Material Nature of Some Non-material Worlds. A more detailed discussion of lucid dreams and how to distinguish them from normal dreams can be found on the Spiritual Travel Versus Dreams page. Some additional examples of spiritual travel in dream environments can be found in the Psychic States section of this site.